Keeping my children healthy is one of the challenges that I face. Giving the kids a safe and healthy environment to grow up is something which I strive to create to ensure that they remain at their optimal health. Living in metropolitan Singapore we are prone to the pollution caused by iindustrialization and the forest fires from neighbouring Indonesia. The kids have sensitive airways and develop coughs and colds easily. Monkey boy often wakes up with a cold and starts sneezing when his nose registers a change in temperature. Doggie boy gets a phelgmy cough and irritated throat easily while Tiger girl is prone to sneezing and runny nose if her airways are irritated. It is extremely important to me that I maintain good quality air at home for the well-being of my family members. With the start of the new school year the kids are being exposed to many different germs and viruses while they are in school. Although I cannot do anything to curb their exposure to nasty bugs in school there is something which I can do on my part at home. I can help strengthen their immunity to attacks from viruses and infections by keeping the air at home clean. I do not wish for the kids to fall seriously ill or develop serious respiratory problems due to the hazardous air quality. Having a young child admitted to hospital for acute bronchitis was an absolute nightmare for me in 2007. It was really heartbreaking for me when Doggie boy was admitted to hospital as a 4 month old baby. It felt like a stake was driven through my heart seeing him having to be constantly put under an oxygen box to breathe during his one week stay at KKH. Never again do I want undergo such a traumatic experience with my other kids if it can be preventable. Even though the numbers are not as frightening as when the PSI level reached 400-500 during the haze last year, I am not taking any chances when it comes to protecting my family members against this invisible ” enemy” when I know that is is possible to reduce the chance of them falling ill with a good air purifier at home. 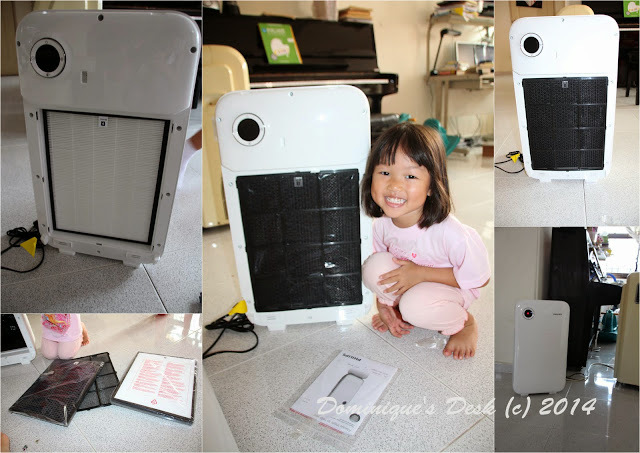 Tiger girl showing the inside of the Philips Air Purifier and helping to fix it up in the process. Being an ardent user of Philips products I was really glad when I received the Philips AC 4014 Air Purifier for review. Weighing just 6.1kg, the Philips AC 4014 is the perfect addition to our house. It has a 3-step natural advanced filtration system, using high-grade HEPA filters that remove up to 99.97% of dust particles, thereby improving the quality of indoor air. Step 1– Washable Antibacterial pre-filter that catches big particles like regular house dust and pet hair. Step 2– Activated carbon filter that removes odors and harmful gases like benzene, formaldehyde including cigarette smoke and VOC emitted from household cleaning supplies, and paint fumes. Step 3– Antibacterial HEPA Filter which can remove 90% of ultrafine particles (PM2.5) in the air including airbone viruses carried in droplets, moulds and pollen. Effectively removes 99.9% of bacteria. The front cover is easily detachable and it is quite easy to fix up. After removing the plastic casing from the covers, all you need to do is put it back into the purifier following the number sequence labelled on the filters. The Philips Air Purifier 4014 showing a RED indicator noting the bad air quality when the windows were all open. The Philips Air Purifier has the following features. There is a Filter replacement alert which indicates when the filters need to be replaced. – Even though there is a Healthy Air Protect Alert which comes on when filters need to be replace it would be useful that there is a seperate indicators for the AC filter and the HEPA. This would be easier to monitor the lifespan of the respective filters within the air purifier. If these features could be addressed it would certainly be perfect!! Made for usage in the living room the Philips Air Purifier 4014 gives me a peace of mind with the current haze situation. The kids are ensured that the air quality at home is good and they are breathing in clean air. Philips Air Purifier 4014 (RP: $519) can be bought from the Philips online website or at all major electronic and departmental stores. I love the slim design of that air purifier. I’ve been looking for one but I don’t have a lot of room but this size would work really well. i must say this should go to the necessary appliances/gadgets for home. Even I, my nose is very sensitive to any dust and in any minute, my sinusitis would surprisingly emerge. I don’t think we realize all the little particles that are flowing through the air in our homes. This looks like a great product! I would love to have an air purifier in my home. I suffer from horrible allergies year round even though I stay indoors most of the time. Looks like a really nice purifier- love the sleek design! Thanks for sharing! This is a must have nowadays! Will check this one real soon and see if we can buy one for our home too! I don’t think I have seen this in any of the appliance shops here before. Now I am interested to see how my it is here at home. We live in the suburb, the village far from highways but these days, this does not matter. The pollution reaches everywhere.